Starbuck is a very special dog to me. 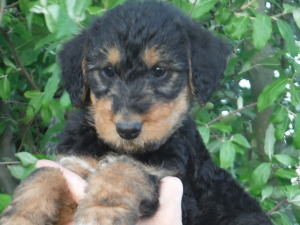 She is the only Airedoodle we have ever raised from one of our own litters. This is Starbuck as an adult. She is a wonderful product of her purebred parents. Rather than the soft, fairly curly coat that many of my Airedoodles have, she has the wiry, grizzle and tan coat of an Airedale Terrier. It is non-shedding and does not tangle. 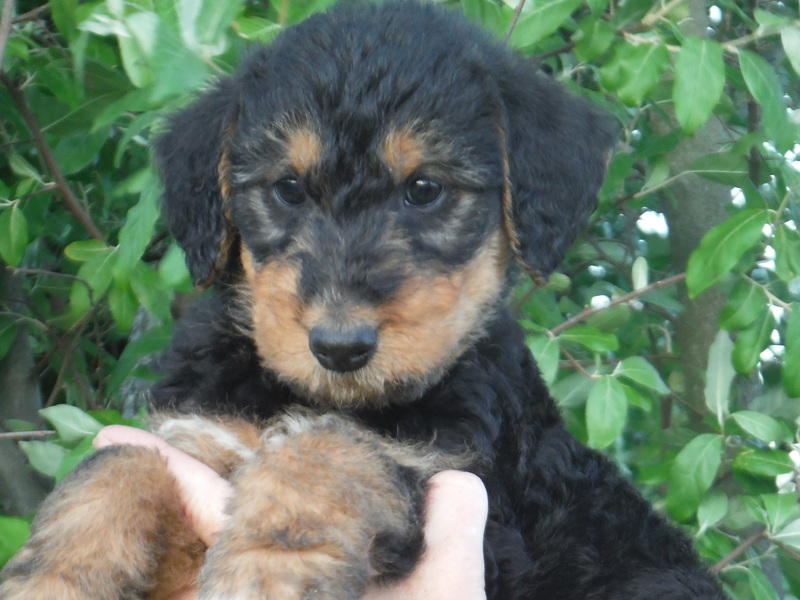 She has a strong Airedale type head. Her frame is lighter weight like her poodle mother and she loves to please me like a poodle does. She is very athletic, walks on a leash beautifully, and was easy to train. She has been a great asset to us because she loves to play with any dog or pup on the property. Here she is cuddling with one of Adelaide’s puppies. 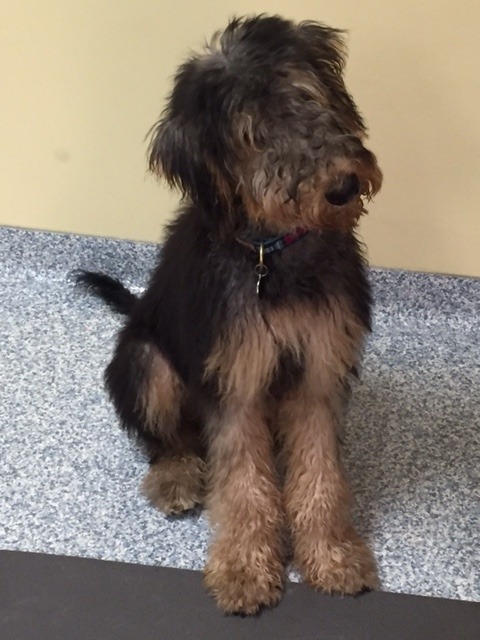 Starbuck is 24 inches at the shoulder and weighs 50 lbs. 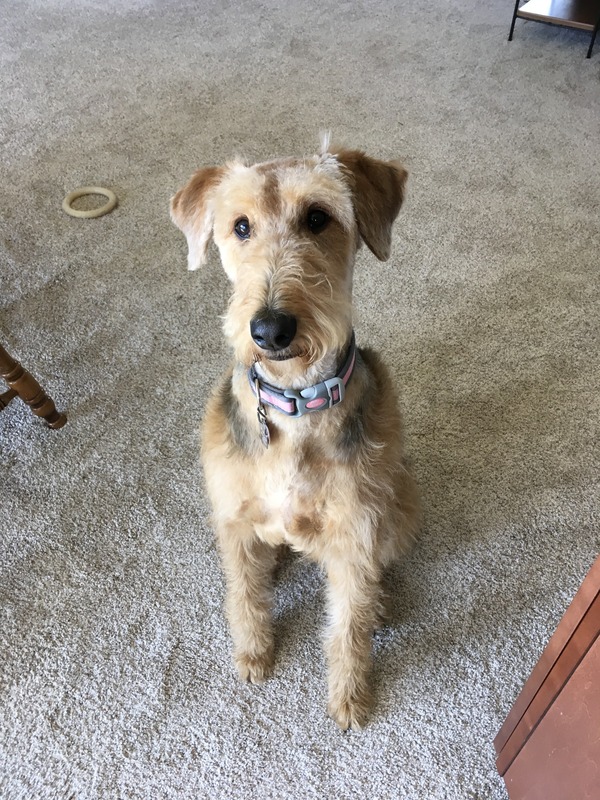 She is 50 / 50 Airedale Terrier and Standard Poodle. She has been bred to our stud Jameson. Their pups will be 75 % Airedale and 25% Poodle. Starbuck’s 2018 litter was born on 4/19. She gave us 10 beautiful pups. All of them are SOLD. 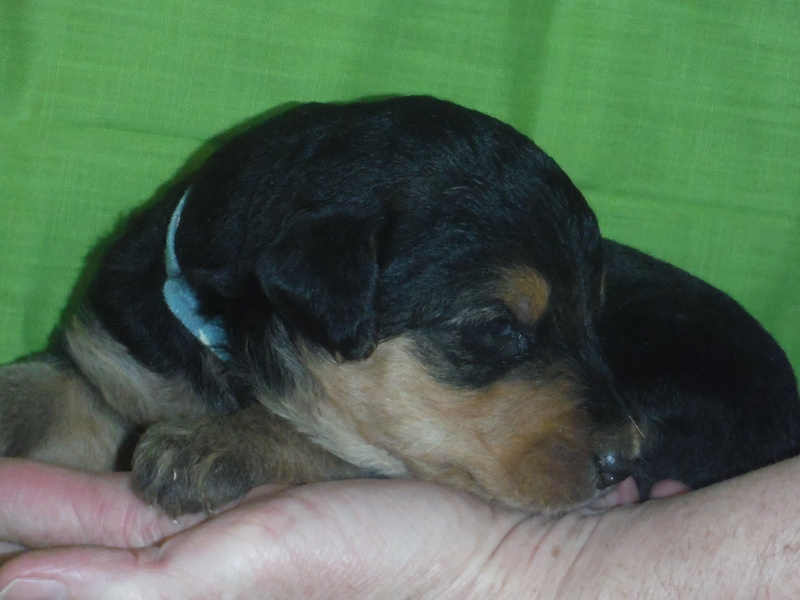 All of Starbuck’s puppies are black and tan and priced at $1200. Deposit $200. We are beginning the deposit list for the Spring 2019 litter. Check her litter page for updates. 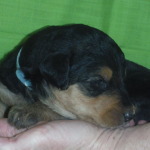 Starbuck’s Gallery: Pictures of pups from Starbuck and Jameson’s first litter. 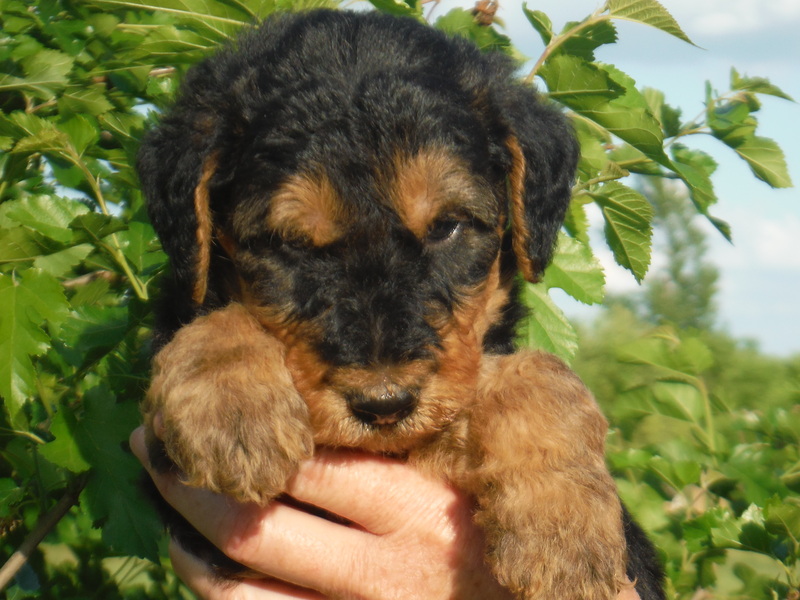 This is Boondoggle at 5 weeks of age. His owner says: “I named him Boondoggle but I mostly call him Boon, which fits because he is something I am thankful for every day. 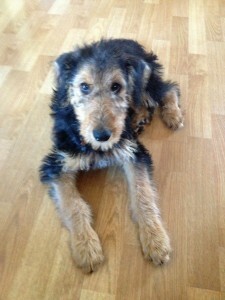 He has been a very good puppy, very smart and quick to catch on to things. 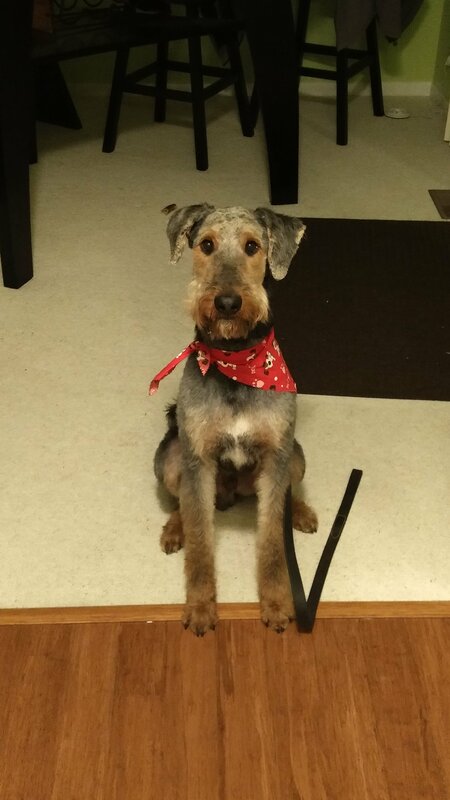 Right now he is a little lanky with mop-like doodle hair, but I’m not sure what this will end up looking like as an adult. He seems to have a good structural composition and a beautiful smooth gait. He really enjoys being around other dogs as well as people. 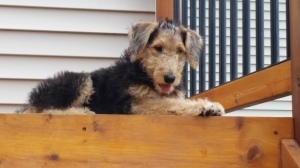 His personality is just what I had hoped for.” Thanks, Ellen, for making a great home for Boon in Georgia. Kaci lives in Minnesota with her family. Thank you, Janelle. He’s teething right now so of course chews on everything he can get a hold of. 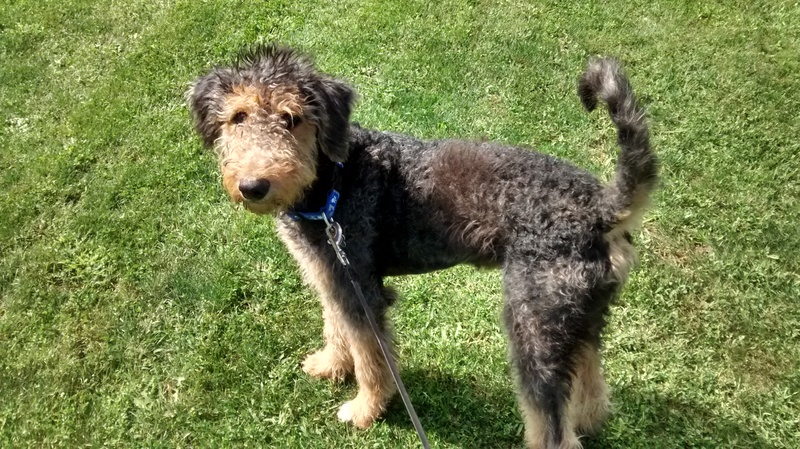 Baxter is extremely friendly and gets along get with other dogs of all types when we take him to the nearby off leash dog park.” – Thanks to Marijo of Michigan. 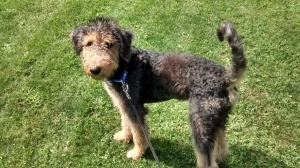 This is Woodson at 7 months of age showing of his new Airedale haircut. Here we have Cookie at 7 months of age and also showing off her Airedale haircut.